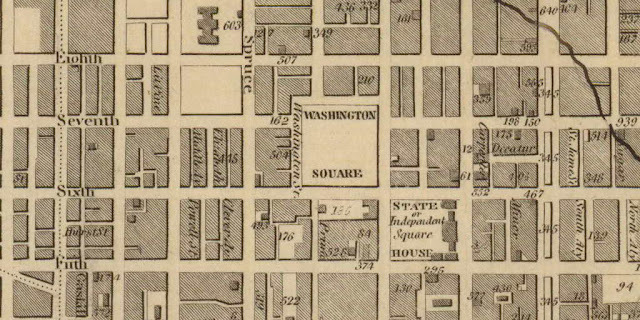 Here is a section of Simons' Map of Philadelphia, 1831, Delaware River to the bottom, and therefore north to the right, showing South Alley, at the far bottom right, where Rosanna Harbeson is reported to have lived. It's a block and a half north (right) of Independence Hall (the building on the right side of Independence Square). The alley has long since been demolished to make way for the Independence Hall Visitor Center. But judging from the contemporary directories, it was a busy commercial center, an odd place to live, except there was a boarding house at 2 South Alley. One deduces, therefore, that Rosanna was a transient, possibly newly arrived from Ireland, when she died. There is no evidence of other members of her family in the neighborhood. The Holy Trinity church and cemetery, where she was buried, is on the top right corner of Sixth and Spruce. It was of course normal for Catholics to live a few blocks from a church. So, still a mystery. She was almost certainly from Ireland, but did she arrive alone? And what killed her at age 30? Edit: oh dear. The widow Brown's boarding house at South Alley was apparently a bordello. Philadelphia in 1825 was a notoriously libertine city, with an active seaport and a red light area called 'Hell Town', although Mrs Brown's establishment was not in Hell Town and was apparetly a cut above the usual knocking-shop.